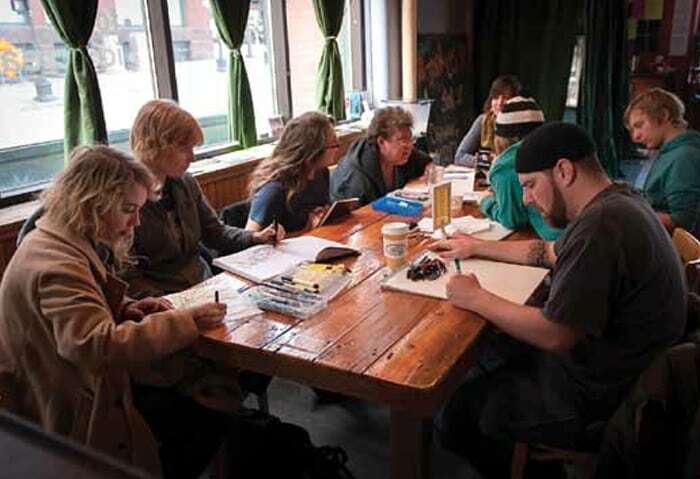 Artists’ drawing circle in the Black Dog Coffee and Wine Bar. Almost all of the artists pictured contributed artwork to this Almanac. The final stop on the new Green line light rail in Saint Paul is historic lowertown: easy to get to, very walkable, and connected by the Morgan, Bruce Vento, and Gateway bike trails. Originally called “Lowertown landing,” the port was the first point of access to the twin Cities from the Mississippi River, a bustling hub of factories, warehouses, railroads, and banking and distribution buildings that served the entire upper Midwest from 1860 to 1920. Lowertown’s boundaries are Seventh Street to Kellogg Boulevard from north to south, and from Robert Street to the Kellogg Bridge from east to west. Lowertown’s old brick buildings, many of them Revivals and Victorians from the late nineteenth and early twentieth centuries, are now home to a vibrant community of artists and many small independent businesses. People in lowertown exude a welcoming energy, and their laid-back, offbeat vibe propels the ongoing neighborhood renaissance. the Saint Paul Saints baseball team chose lowertown as the site for its new stadium, designed to be one of the greenest stadiums in the country when it opens in 2015. Lowertown is the place to visit on weekend mornings between late april and november, when a bustling farmers’ market offers a dazzling array of local food and crafts that originate from within one hundred miles of Saint Paul. Farmers offer fresh vegetables and cut flowers; other local merchants sell artisan chocolates, salsas, cheeses, and meats from nearby farms. a pop-up bagel shop serves coffee and lemonade, and there’s often entertainment—music, storytelling, and magicians. in the winter, a scaled-down outdoor market continues, with an indoor wing across the street in Golden’s Deli, where delicious offerings of honey, maple syrup, and bakery items are sold. Across the street from the market, the northern Warehouse building is home to the main community hub of lowertown, the Black Dog Coffee and Wine Bar, offering locally sourced and often organic soups, sandwiches, beer, and unusual wines, with monthly exhibits by local artists on its walls and an impressive roster of people performing blues, folk, and many genres of jazz. Here, neighborhood residents gather for games and friendly socializing, or to work on sketch books and canvases. the Saint Paul Almanac hosts poetry readings and spoken word performances at the Black Dog throughout the year, rebroadcast on local cable channel SPnn. The northern Warehouse is also home to the Japanese tanpopo noodle Shop and, also at street level, the AZ Gallery, which offers a diverse spectrum of exhibits, including Saint Paul Public School children’s art shows. Opened in 2013, and within a block of the farmers’ market, the three Sisters Gallery offers a quality range of local crafts, art, jewelry, and furniture. turn up in lowertown for First Friday evenings, the spring or fall art crawls, and the annual northern Spark festival to meet the artists themselves. Music festivals throughout the summer and fall take place at Mears Park, the location for the Jazz Festival, Concrete & Grass Festival, American Guitar Festival, Roots Festival, and free concerts every thursday of the summer, as well as movie nights. Golden’s Deli and the nearby lounge bar/restaurant Senor Wongs—with a delightful Mexican-asian fusion menu—host lowertown’s open mic nights, with Golden’s also offering a comedy open mic. Visitors and locals alike find plenty of places to eat around Mears Park at restaurants such as the Barrio Tequila Bar, Bin Wine Bar, the Bulldog pub, Faces-Mears Park, and Trattoria da Vinci. Serious diners revere the nearby Heartland Restaurant for cutting-edge cocktails and cuisine made from indigenous and cultivated ingredients from the american and Canadian Midwest. Owned by award-winning chef Lenny Russo, the Heartland—and its adjoining Farm Direct Market deli—offer menus that change daily, depending on what farmers bring to the back door. Three neighborhood bars—Kelly’s Depot Bar, the Gopher Bar, and the Hat trick lounge—offer visitors a uniquely local pulse.